The reboots weird because I think parts of it are memorable but most of that is attributed to TR13. Rise and Shadow I would say didn't really do a good job of sustaining that popularity. Reboot Lara's TR13 Survivor look is certainly iconic. What if square lost interest in making tomb raiders because of their low sales and eidos/crystal/montreal or whoever is responsible decide to drop the series all together? I mean shadow was the last part of the reboot trilogy, it would make sense for them to at least now stop creating more games in that specific lara universe. TBH/TBF I heard SE has been going through some struggles... may or may not pertain to the the disappointment of FFXV. Maybe the feel TR is the only one keeping them a bit up. Can't rely much on FF7 remake and FFXVI. But I AM all for SE dropping TR for good. Like I said before, TR does NOT need SE's jrpg/rpg, no. I always find it odd when people downplay the reboot’s status as iconic - Lara’s redesign, her equipment and bow, the violent and gritty take on a modern action adventure, it’s all quickly recognisable and left a positive impression on the industry, considering it turned out to be a financial and critical success. I totally get it not being iconic to you, but I’ve seen people insist it doesn’t have a lasting identity at all a few times and I’m just like . This render alone is iconic to me. I still wish they’d managed to make her look like that. The Lara now isn't that iconic as past Lara. 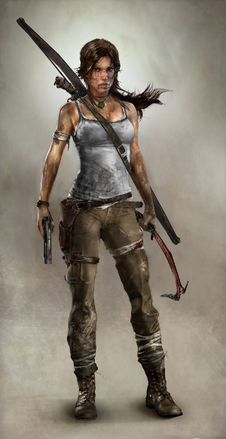 I'd go to even say Ellie is more iconic than reboot Lara. This Lara sadly followed trends that were quickly forgotten throughout the past years. Her bow is dated, her axes aren't done justice, and her development was depressing. However I will say that this series was successful even though they played it safe 110% of the time and they barely made it out alive after Shadow but nontheless we made it. I'd say after this break they should have some fresh ideas. People who don't play video games still recognize classic Lara, but when they see my TR2013 figures they ask if it's Katniss Everdean. I do really like Lara's design quite a lot in TR2013, and to gamers her look is iconic and distinctive, but it doesn't hold the same power as classic Lara's design. My post wasn’t suggesting that the reboot was as iconic as the classics, just that it’s distinctive and recognised by a wide amount of people in its own right. Just bugs me when people downplay it. This is so true. The bow thing should've stopped immediately after 2013. If she escaped the island and survived, why on Earth when anyone want to still use wooden weapons??? She really used the same bow from Rise at the beginning of Shadow. That's fair and I can agree with that. This exactly. Not as iconic as the classics but iconic in her own right. Especially for a reboot of a character featuring a whole image. I don't think people realize how many reboots of franchises have failed. Last edited by TrustyBow; 11-01-19 at 04:57. Well to be fair you can't really blame people for downplaying it. Reboot Lara came around after all the hype of the Hunger Games and Katniss, so people already associated the bow with Katniss. Unfortunately Lara was late to that party, and ended up looking like a copy - especially when Lara was already so uniquely defined with pistols, shorts and a braid. But let's just push that aside and look at the gritty, brutal tone. It was fresh for TR2013, and was one of the defining things that made the game stand out. It made sense for an origin story, but it certainly got less 'wow' and more gimmicky with Rise then Shadow (IMO it's what pushed TR into an identity crisis). By the same token though by 2013, you already had that massive trend of making super heroes gritty and realistic, wannabe-relatable with the likes of James Bond in Casino Royale and Dark Knight with Batman - two franchises which the devs sited as inspiration. It wasn't exactly a fresh or unique idea at that point. Yes, to the Tomb Raider franchise, but not to the entertainment industry as a whole. So while you find Reboot iconic, and you have every right to do so, I feel it's disingenuous to find an issue with people who didn't find TReboot iconic when they were only following established trends. However, what I will say is axes are truly unique to Lara IMO and are actually iconic. I hope they stick around. Last edited by Swiz19; 11-01-19 at 05:09.